With The Mitsubishi Motors Badminton Horse Trials weeks away we are delighted that Camilla has joined the team as blogger in the run up and after the dramatic week. 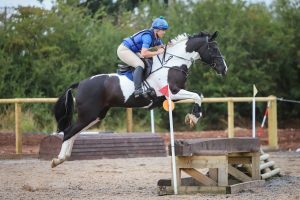 Hi, I’m Camilla, an amateur eventer based in Shropshire, and together with Kellythorpes Adonis G, we are excited to have qualified for the Mitsubishi Motors Cup this year in the BE90. I’ve owned Bailey since he was 3 so we have done everything together, including an uninspiring attempt at a 4 year old class! Bailey is now 7, piebald British Warmblood by Amour G, we’ve done some show jumping, qualifying for the Amateurs and Blue Chip championships, and coloured showing too with some success. Bailey has so far done all this without shoes as he has wonderful feet, so we are saving many hours cursing at stud holes! I had 2 regional finals last year and somewhat surprisingly we qualified at our first attempt at Shelford Manor. It totally threw me when I cantered towards the first show jump as they announced our dressage score of 22, which didn’t make for a pretty round, but we completed double clear for 2nd place! This year in prep for Badminton we have stepped up to BE100. In a bid to get at least one run in we managed to go to Aston Le Walls, which always feels too early in the year, with dark days and usually plenty of mud (or snow!) We were very lucky to have a bright sunny day and perfect going, to score another surprising dressage of 23 and double clear to come 3rd. As is somewhat usual our other runs have so far been abandoned so lots of galloping, cross country schooling and show jumping lined up for us in the next month. Now I just have to get us through the next 4 weeks safe and sound….